If you are a bibliophile (like I am) then books are your thing. This also means that books are very personal. Books take on a life of their own, even instructional based books. 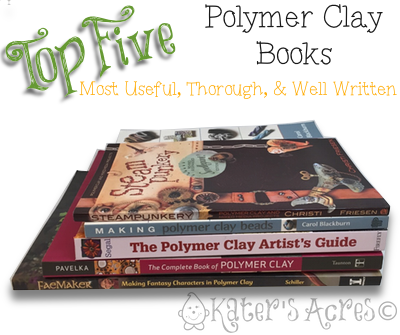 I have assembled the “top five” polymer clay books, based on my opinion alone. I will also recommend an additional 3 books that also rank very high on my list, and in fact made this a very hard decision in 3 of my categories. If you are a polymer clay artist and would like to recommend a polymer clay book that perhaps didn’t make my cut, feel free to do so in the comments below. Every single polymer clay studio needs a good “everything” book. This is a book that you turn to often because it has hints, tips, inspiring projects and much more in it. My pick for this category is Lisa Pavelka’s “The Complete Guide to Polymer Clay.“ I have already done a full & complete review on this book. You can read more specific details here. The reason this book made the cut over all the others is because it has two things the other ‘comprehensive’ books don’t do as well. Not only is this book filled with projects, but each project has 1 or two other techniques that can be used with it. Additionally, it has the best pictures & most concise reading. There are a lot of books that focus on specific art techniques from bead making, miniatures, flowers, sculpting, and much more. However, Marie Segal’s “The Polymer Clay Artists Guide” goes way above and beyond the competition. Marie presents surface techniques and design ideas using a variety of mediums from foils, leafing, chalks, acrylics and much more in this fantastic guide. I have already done a full & complete review on this book. You can read more specific details here. Admittedly, this guide is best for those who do bead, tile, & mosaic works. This was a very difficult decision for me. As a sculptor, I tend to devour these books and I have almost all of them that have been written over the past 15 years. My top of the line pick for best polymer clay book on sculpting goes to Dawn Schiller’s “FaeMaker: Making Fantasy Character’s in Polymer Clay.” These are so many wonderful parts of this book. Dawn masterfully walks you through supplies, tools, and even making ‘clothing’ for your fantasy characters. The text is brilliant and pays enough attention to detail that you could complete the tasks without the pictures. However, the pictures are flawless and there are so many that by looking at pictures alone you can see where Dawn is going and how to sculpt your fantasy creature. A very close runner up in this category is Maureen Carlson’s “Fairies, Gnomes, & Trolls: Create a Fantasy World in Polymer Clay. There have been many very good books written on polymer clay beads & jewelry making. But the one that pulls ahead for me is the first polymer clay bead book I ever bought, Carol Blackburn’s aptly named “Making Polymer Clay Beads.” This book takes very basic and simple techniques and inspires new and intermediate artists how to make their own and even provides tips along the way. Photos are bold & colorful in this book. But what shoots this book to the forefront are the variety of beads shown on each page with the tutorial. This variety shows how color and size can make a huge impact on the same bead. This puts Carol’s book still in the number one spot. There are many great books that fit this category, but in my opinion no book can top any of Christi Friesen’s wonderful polymer clay books. But my pick (of all her books) would have to be “Steampunkery (Revised & Expanded)” There are oodles of fun and unique projects. You can use each project as a springboard to your own imagination! This book is fun & the way Christi writes is a real treat and will leave you smiling, if not laughing out loud. The new edition features a section with a showcase of Christi’s Swellegant products and how to use them. I have already done a mini review on this book when we ventured through the 2013 Friesen Project together. You can read more specific details here. A very close runner up in this category would be any of Christi’s other books. You can see them all on Amazon (some available on Kindle too). Thoughts & opinions expressed here are my own. I was not paid to mention or promote these books. It’s so hard to choose just five really good polymer clay books. Why? I have over 50 polymer clay books on the shelves of my studio and there are very few I do not own. To all the artist’s who put themselves and their talent out there for the world, thank you for your contributions to polymer. If you have the books above and are looking to add a few more to your own shelves, the three below are also excellent books. Honorable book mentions for other great books go to: “The Art of Millefiori Techniques” by Donna Kato, “Patterns in Polymer: Imprint & Accent Techniques” by Julie Picarello, and “The Polymer Clay Techniques Book” by Sue Heaser. Previous post: Polymer Clay Studio: What’s In My Spinner?